comfort | Mzsunflower's Say What? This picture has gone viral. And you’ll understand why in a moment. That’s Officer Nick Struck from the Brighton, Colorado Police Department. He’s trying to distract that little girl he’s holding. 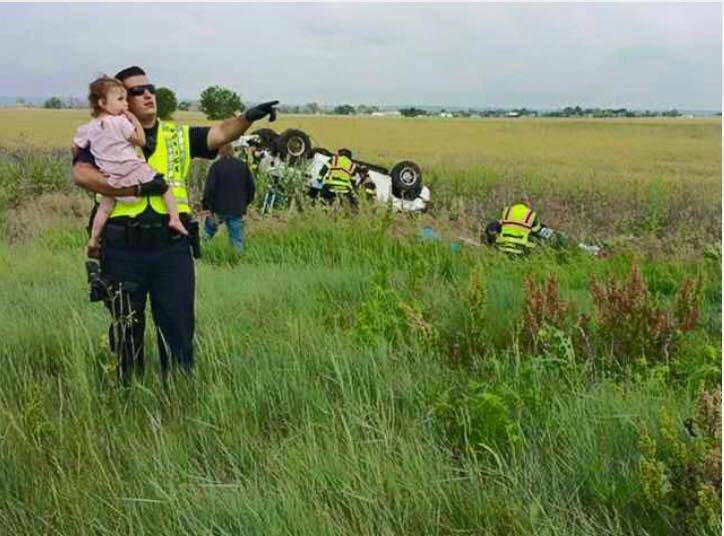 He wanted to keep her from learning that her daddy just died in that car behind them after it rolled over. There were six people in the car. Two adults and four children. And it appears no one in the car was properly restrained. Because all of them were ejected. The little girl’s father was the only person killed in the accident. The other adult and three of the kids were taken to the hospital. But the little girl in the picture wasn’t hurt. Officer Struck said he could relate to her because he has a young daughter at home. “I have a two-year-old daughter and she’s my first kid. The picture was taken by Jessica Matrious. She just happened to be passing by at the time. And what she captured is a piece of police work that we don’t see very often. The Brighton Police Department posted this picture and the story on their Facebook page. “We are extremely proud of the men and women of our department! “His photograph symbolizes what police work is. Giving a bit of comfort while in the background total chaos is going on. “While it’s never going to detract from this little lady losing her daddy, the officer has made her trauma just a little more bearable. And I sure hope that little girl is going to be okay. At some point she’s going to learn that daddy is not coming home. And she’s going to need all the support she can get. Picture courtesy Jessica Matrious via Brighton Police Department Facebook page.